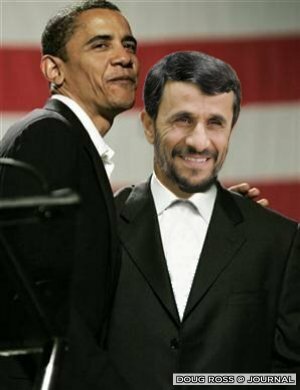 let’s talk about Obama's policy toward Iran and Iran's leaders response. first of all i must say that i am not in favor of Iran's leaders in resisting to start dialouge with united state and i have no doubt that their resisting because they will see their legitimacy in danger if relation between 2 country become common like other countries so they give many points and priorities to other world powers such as china and Russia to support them in cold war between them and US. but also let me say that i see Obama's policy toward Iran paradoxical from beginning .Obama says "we will extend a hand if you are willing to un-clench your fist"
Obama every new Persian year send message to Iranians and Iran's leaders and ask lets forgot all bitter events in the last 30 years and start a new age for tow nation and 2 countries .but as an Iranian who live inside Iran frankly i must say Obama policy is only a blah blah ! policy and in 1.5 year we all see no practical act as sign for a change .for example US.S could allow Iran to buy new civil planes to reduce air crash in Iran or let peaceful technology such as new generation mobile network or new IT devices such as smart phones ,laptop easily without any sanction use by Iranians or even other technologies such as new cars or medical devices and…. let’s be honest Iran has a big population of young people which they are seeking new opportunities and new thoughts so more hard sanction only could help young generation will absorb by fundamental thoughts but if they put in a free society and environment with modern and useful devices and technology such as broadband internet they will not believe all of the words by Iran's leaders .in other hand more sanction caused more terrible economic crisis in middle class families in Iran that goes society to hibernate situation that the only thing which is important for families is their basic needs so there is no time to think to other needs such as freedom or education or what reason caused this situations for their poverty. I've been observing Obama's Iran policy within the United States. I'm not hopeful myself. I think he is afraid of the conservatives in his own country right now. He can survive the passage of the Health Care Bill politically but he can't withstand the criticism that he would receive from the conservatives in the US if he were to lift some of the sanctions you mentioned. the US media coverage of the 1388 presidential controversy is the main reason for the strong feelings. People in Iran have to change the regime. i don't know how you live with slow internet, sites blocked and ext. Please don't give up. We hear you. Dear Under Underground, We are listening to you albeit from a great distance. Your English is better than me trying to speak your language. :) It is true here as it is there that some men and some women here need to have power over the masses to assuage the monsterous ego problems they have. They forget that people are not that stupid and know what they are doing. Keep the hope and the faith. Keep writing. My prayers are with you there. ISRAEL: THE CHOSEN PEOPLE OF SATAN – DEVIL – SIN – SION – ZION – SINAI – JEDI – JUDE - JUDAS, OVER THE EARTH.